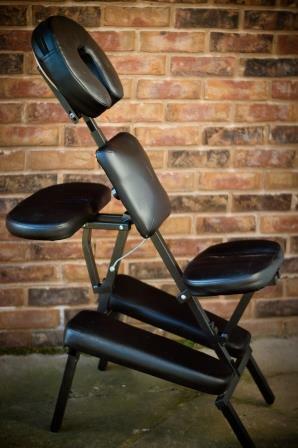 Onsite seated massage is a touch therapy blending eastern and western massage techniques which can benefit many types of people in many settings. The origins are based on Anma massage meaning “press and rub” which was introduced to Japan 1500 years ago and records go back as far as 3000BC. The west has used these techniques popularly since the 1980s in USA, UK and Europe in a range of settings. Particularly with the rise of stress related illness, improvements in health and safety at work and research conducted into the relationship between staff sickness, morale, motivation and the success of the business. For example, corporate settings such as offices, airports and conferences, at events such as fayres, demonstrations and festivals and private settings such as holiday cottages, pamper parties and in salon or at home clients, inside or outside. 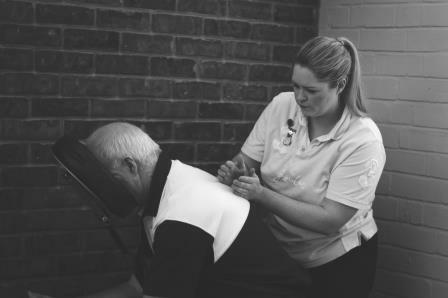 This type of massage is sometimes called corporate massage, massage over clothes, workplace massage, seated acupressure massage, chair massage or onsite seated massage. The treatment is conducted usually in a massage chair over clothes or adapted to a normal chair, face cradle attached to a table or with the client lay on a treatment couch, sometimes with oil or another massage medium on exposed areas. The upper body is working during this treatment with treatment times ranging from 5 minutes to 45 minutes.